The rear camera is a decent 8 MP sensor that is supported by LED flash for enhanced low light photography. This snapper is accompanied with a 1.3 MP front-facing shooter that can help in making video calls and in clicking self portrait shots that is the recent trend. Considering the pricing of the handset, these camera aspects are pretty decent and acceptable. Internal storage capacity is quite impressive at 16 GB that can in turn be expanded externally by another 32 GB by means of a micro SD card. Moreover, the native storage space should be enough to store all the default software and other applications without the necessity of additional storage. 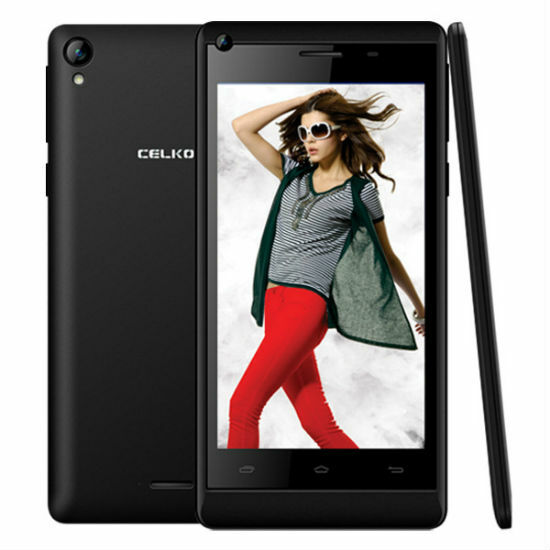 Celkon Vogue Q455 is powered by the quad-core Broadcom BCM23550 SoC that was used in the newly launched Lava Magnum X604. This processor is paired with a VideoCore IV graphics engine to handle the intense graphics requirements and 1 GB of RAM for multi-tasking. The BCM23550 chipset brings in support for HSPA+ and has power management IC, RF transceiver, multi-constellation GNSS location chip and connectivity combo chip. The battery in the smartphone is a 2,000 mAh unit that should be capable of pumping in decent backup to the device. Moreover, this battery capacity makes the device on par with its rivals that are available in the market. The Celkon Millennium Vogue Q455 comes with a standard 4.5 inch qHD IPS display carrying a resolution of 960×540 pixels. This makes the device an average one that allows it to handle the basic capabilities with ease. The Celkon Millennium Vogue Q455 is fueled by Android 4.4 KitKat operating system and it packs a slew of usual connectivity features including 3G, Wi-Fi, Bluetooth, GPS and dual SIM functionality. The Celkon phone will be a direct competitor to the other smartphones such as Lava Magnum X604, Xolo Q600s, Xiaomi Redmi 1S and Moto G.
The Celkon Millennium Vogue Q455 is a decent offering that arrives with pretty impressive specifications providing a great value for the money paid. The handset gets benefited from its decent hardware that comes with a capable camera set, good storage space and competitive pricing. Already, the smartphone vendors such as Asus, Motorola and Micromax are stacking the shelves with such solid smartphones at reasonable pricing. With the addition of the Millennium Vogue, the consumers looking for sub Rs 10,000 priced smartphones will definitely be spoilt for choice.